Cellulose soaked in a carefully designed polymer mixture acts as a sensor to measure pressure, temperature and humidity at the same time. The measurements are completely independent of each other. The ability to measure pressure, temperature and humidity is important in many applications, such as monitoring patients at home, robotics, electronic skin, functional textiles, surveillance and security, to name just a few. Research until now has integrated different sensors into the same circuit, which has presented several technical challenges, not least concerning the user interface. Scientists in the Laboratory of Organic Electronics at Linköping University under the leadership of Professor Xavier Crispin have successfully combined all three measurements into a single sensor. 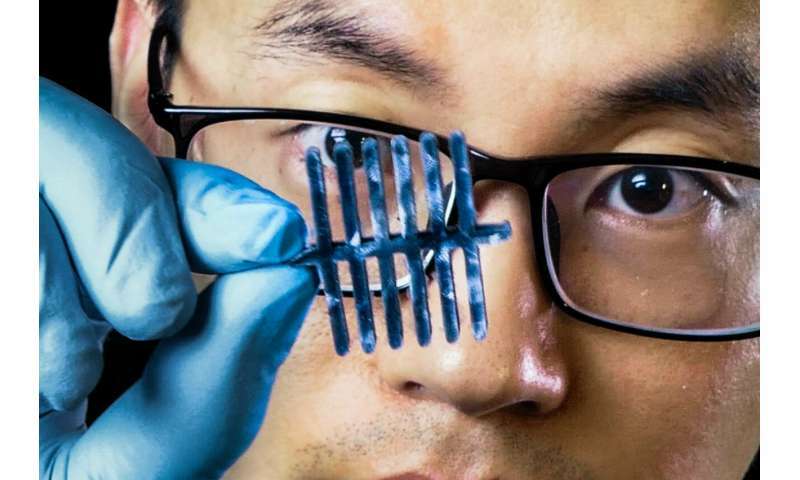 This has been made possible by the development of an elastic aerogel of polymers that conducts both ions and electrons, and subsequent exploitation of the thermoelectric effect. A thermoelectric material is one in which electrons move from the cold side of the material toward the warm side, creating a voltage difference. When nanofibres of cellulose are mixed with the conducting polymer PEDOT:PSS in water and the mixture is freeze-dried in a vacuum, the resulting material has the sponge-like structure of an aerogel. Adding a substance known as polysilane causes the sponge to become elastic. Applying an electrical potential across the material gives a linear current increase, typical of any resistor. But when the material is subject to pressure, its resistance falls and electrons flow more readily through it. Since the material is thermoelectric, it is also possible to measure temperature changes. The larger the temperature difference between the warm and cold sides, the higher the voltage. The humidity affects how rapidly the ions move from the warm side to the cold side. If the humidity is zero, no ions are transported. Shaobo Han, doctoral student, and Senior Lecturer Simone Fabiano at the Laboratory of Organic Electronics, have also found a way to separate the three signals such that each can be read individually. "Our unique sensor also prepares the way for the Internet of Things, and brings lower complexity and lower production costs. This is an advantage in the security industry. A further possible application is placing sensors into packages with sensitive goods," says Simone Fabiano.